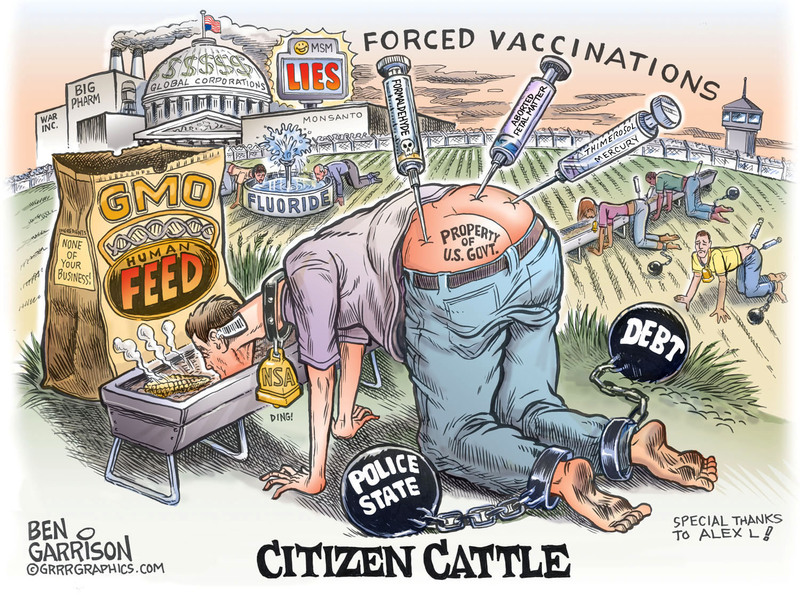 The more we let government decide things for us, the more we become their cattle. We aren’t supposed to question government. After all, they have our best interests at heart, right? We fear our militarized police and they treat us like animals, not citizens. The government says we don’t need to know if we’re eating GMO foods. We don’t need to worry about fluoride in our tap water. A little bit of poison can’t hurt us. Sure. We don’t need to worry about the falsehoods being told to us by mainstream media. We are burdened with debt (especially college kids) and debt slave money is designed to shackle us. We all become poor and on the dole. It’s just big government taking care of us, right? A few years ago I drew a cartoon that featured forced inoculations and I was laughed at. But now it has become a law in California and some presidential candidates such as Ben Carson are openly espousing it. It’s inoculation by force. It’s inoculation by the point of a gun. Do citizens no longer have a choice about what they eat and drink? Don’t we have control of our own bodies? Don’t we have say? Well, we’d better start speaking out against these things before the government decides we are ready to be sent to one of their slaughterhouses. This entry was posted in Crony Capitalism, General, militarized police, Tyranny Watch and tagged ben garrison cartoons, big government, citizen cattle, fluoride, forced vacinations, foreign banks, freedom, gmo food, grrrgraphics.com, Police, police state, political cartoons, Take a bite out of tyranny, United States. Bookmark the permalink. Love Love Love your cartoon! You want to know WHY Ben Carson espouses forcing vaccines? Because he’s Chairman of the Board of a vaccine company! He says he resigned that position, but I’ve been waiting months for them to take down his title & picture, and they have not. Thank you for those kind words Suzanne! I will be doing another cartoon this week so stay “tooned” !